A usually reticent Sonia Gandhi shocked everyone in the Lok Sabha today on Day 1 of the monsoon session with her unprecedented show of aggression that forced BJP veteran LK Advani to retract his remarks that the UPA-II was an �illegitimate� government. 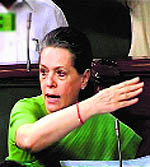 Riled: Sonia Gandhi gestures angrily in Parliament on Wednesday. Former Haryana Minister of State Gopal Kanda, accused of abetting the suicide of his former employee Geetika Sharma, failed to turn up for police questioning on Wednesday and was declared an absconder. Interview with Australian swimmer Stephanie Rice, who had won three gold medals in Beijing and broken two World Records. Wade Michael Page, the 40-year-old White supremacist who went on a shooting spree at a gurdwara in Wisconsin on Sunday, committed suicide after sustaining a bullet injury to the stomach, law enforcement authorities said on Wednesday. The Punjab and Haryana High Court today ordered a probe by the Central Bureau of Investigation into a land acquisition deal that allegedly benefited three influential families in cornering Rs 5.63 crore. We are happy to announce that starting today, Tribune readers in Kashmir will receive Kashmir Tribune, a daily pull-out, along with The Tribune. Kashmir Tribune will endeavour to capture the spirit of change in the Valley and blend news with features with a finger on the pulse of its people. Chief Minister Omar Abdullah is a man in a hurry, running against time to fulfil the promises that he made at the time of assuming office over three years ago. He is also trying to perfect the art of tightrope walk in the state politics.